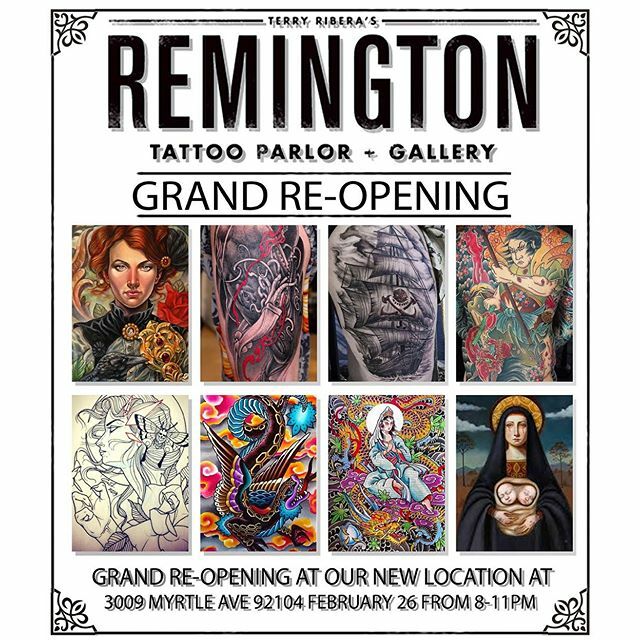 Please join us February 26th, 2016 from 8pm-11pm to celebrate the new home of Remington Tattoo and Gallery with an Art Show of original works from the Remington crew. Located at 3009 Myrtle Ave 92104, our new location boasts larger square footage, customized work stations, and some new artist additions to the Remington Family. Along with our Art Show, we are also hosting a canned-food drive for Mama’s Kitchen with a raffle featuring prizes from local businesses and artists. Help us support this great cause by bringing canned-food goods to donate, each can equals one raffle ticket, so bring as many as you’d like! We appreciate having this opportunity to thank all of our clients for their continued support throughout the years, and we look forward to celebrating our new space with you! Adult beverages and snacks will be served.